Is the Pope still missing the point? VATICAN CITY (Reuters) — Pope Benedict has written an “anguished” letter to Church leaders admitting the case of a Holocaust-denying bishop was mishandled and warning the Church risked “devouring itself” with internal squabbles. The Vatican said at the time it did not know that Williamson was a Holocaust denier but critics said a simple Internet search would have found he had made such statements. “Doesn’t the Vatican know about Google?” one prominent Catholic critic said at the time. 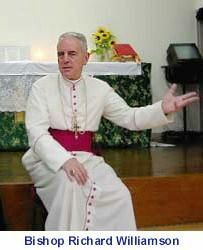 The pope says he could not have foreseen that the Williamson affair would overshadow his intention of bringing unity back to the Church by lifting the excommunications of the bishops who belong to the Society of St Pius X [SSPX]. The Pope’s letter will be released tomorrow, but from the details in the Reuters article it appears that he is still missing the point. The real problem is not that Williamson is a Holocaust denier and antisemite, as evil as he may be. The real problem is the SSPX. The heads of [international] Jewry have for centuries conspired methodically and out of an undying hatred against the Catholic name and the destruction of the Catholic order, and for the construction of a world wide Jewish empire. has nothing to do with religious belief, and everything to do with inciting hatred of Jews. Catholic doctrines concerning the language of the Mass don’t concern me, obviously. Neither do Good Friday prayers which ask God to “illumine [my] heart” or even “lift the veil” from it (although I admit to being bothered a little by “perfidious Jews”). The critical piece of Vatican II for me is the Papal declaration of Nostra Aetate, which insists that while Catholicism is the true religion, nevertheless a Catholic must respect non-Christian religions, which represent other approaches to spiritual truth. So, for example, the traditionalist Priestly Fraternity of St. Peter [FSSP] which was founded in 1988 by SSPX priests who were unwilling to separate from the Church also uses pre-Vatican II Latin liturgy and holds relatively conservative positions on other issues. But the FSSP does not reject Nostra Aetate and its doctrines are not antisemitic. SSPX represents a sizeable number of priests and adherents, with over 100 chapels in the US alone and a presence in numerous countries. I’m sure it’s quite uncomfortable for the Pope to have such large organization in a schismatic position, especially since he is something of a ‘traditionalist’ himself. In my opinion, reconciliation with the SSPX should require an explict statement that they accept Nostre Aetate. Judging by what I’ve read on their site and from their friends and apologists, I don’t think it’s going to be easy to obtain this. But we will learn a lot about the Pope — and the future of Jewish-Catholic relations — from how firmly he stands on this issue. I intend to connect the Pontifical Commission “Ecclesia Dei”, which since 1988 is responsible for those communities and individuals who, coming from the Fraternity of Pius X or similar groups, want to return into full communion with the Pope, in the future with the Congregation for the Doctrine of the Faith. This shall make it clear that the problems now being treated are essentially doctrinal in nature, especially those concerning the acceptance of the Second Vatican Council and the postconciliar Magisterium of the Popes. On January 21, the Pope lifted the decree of excommunication on Richard Williamson, a Holocaust denier and anti-Semite. Williamson (seen on video here) claimed that “not one Jew had been killed in gas chambers” and that only 200,000-300,000 Jews perished in Nazi concentration camps. Williamson and four other members of the ultra-conservative Society of St. Pius X (SSPX) were excommunicated by Pope John Paul II in 1988 when the society’s leader, Archbishop Marcel Lefebvre consecrated them as bishops in defiance of the Vatican. He also declared the society in schism with the church (they dispute this, but see Pope John Paul II’s letter). Lefebvre was quite a guy. He disapproved of the French Revolution, preferring absolute monarchy. He supported the Nazi puppet Vichy regime in WWII, and expressed unhappiness at the liberation of France, calling it an “invasion of barbarians without faith or law”. He bitterly opposed the reforms of Vatican II (1962-65), including the encyclicals Nostra Aetate, which called for religious tolerance and declared that the Jews of today do not bear guilt for the death of Jesus, and Dignitatis Humanae, which condemned civil coercion of religious belief. In his view, much of Vatican II constituted heresy. In 1969 Lefebvre formed the Society of St. Pius X (St. Pius X was Pope from 1903-14 and also opposed modernism). He established a seminary in Switzerland, denounced the Vatican II reforms as heretical and celebrated the traditional Latin Mass. Ordered by Pope Paul VI to close his seminary in 1976, he refused and his right to perform sacred functions was suspended. After the 1988 excommunication of Lefebvre and his ‘bishops’ the SSPX continued to exist, although its status with the Church remained as a schismatic sect. Since then, it has flourished. In the US, the SSPX has chapels in 37 states, schools in 13, and four retreat centers. There are numerous seminaries and headquarters around the world (Lefebvre himself died in 1991). 1. We condemn all persecution of Jews for their religion or for ethnic reasons. The Church is against “anti-Semitism”. 2. But the Church can not ignore the facts of the past and the clear affirmations of international Jewry. The heads of this Jewry have for centuries conspired methodically and out of an undying hatred against the Catholic name and the destruction of the Catholic order, and for the construction of a world wide Jewish empire. This is what Masonic sects and the communists stand for. Money, the media, and international politics are for a large part in the hands of the Jews. Although the Jews are the biggest capitalists and should on that account be the greatest adversaries of the Russians and the communists, they do not fear them, but on the contrary, they help them to win. Those who have revealed the atomic secrets of the USA were: Fuchs, Golds, Gringlass, and Rosemberg: all Jews. The founders of communism were Jews. They are the promoters, organizers and bankers. This is the reality. Should this foster hatred? No! But with vigilance and clear-sightedness we should launch a systematic and methodical opposition to the equally systematic and methodical onslaught of “the enemy of man”, whose secret weapon is “the leaven of the Pharisees which is hypocrisy”. International Judaism wants to radically defeat Christianity and to be its substitute. Its chief armies are the masons and the communists. This process of the Revolution began at the end of the Middle Ages, developed itself by pagan Renaissance, jumped forwards by leaps and bounds with the Reformation, destroyed the political and social basis of the Church by the French Revolution, tried to overthrow the Holy See with by an attack on the Papal States, emptied the Church’s resources on the occasion of the secularization of the goods of religious [orders] and dioceses, was the cause of a very grave internal crisis with the advance of Modernism, and finally, with communism, it invented the decisive instrument to delete the name of Christian from the very face of the earth. Much anti-Semitic material has now been removed from the site, but this letter is still available in Google’s cache. And on the website there remains a 1985 letter to the Pope from Lefebvre and Bishop Antonio de Castro Mayer which counts Jews among “declared enemies of the Church”. The lifting of the excommunication does not include a full reconciliation with the doctrines of the SSPX. But its purpose was to open the door for a rapprochement between the Church and the SSPX, which would take place when certain “open matters” had been resolved. On the one hand, it can be argued that since the four priests were not excommunicated because of anti-Semitism or historical revisionism — these are highly unlikely to be subsumed under the specified actions that can be punished by excommunication under canon law — but rather because of their part in Lefebvre’s forbidden consecration of them as Bishops, their readmittance does not imply acceptance of their pernicious ideas. This is the line that the Vatican has taken, and the Pope himself has taken pains to denounce anti-Semitism and Holocaust denial. The Vatican even said that the Pope was unaware of Williamson’s statements about the Holocaust. But on the other hand, the intention of the Pope’s action was to heal the breach between the Church and the SSPX. Given the anti-Semitic bent of the SSPX, should not more have been demanded — both of the society and the ‘bishops’ — before beginning the process of reconciliation? Certainly Pope Benedict holds traditionalist views about ritual, and for example has relaxed restrictions on priests who want to use Latin liturgy. He is also not likely to call for liberalization of doctrine prohibiting abortion or euthanasia. And in these areas he has beliefs in common with SSPX. But I would like to think that he has strong differences with them regarding religious tolerance — the principles set forth in Nostra Aetate (he was the first Pope to visit a US synagogue, when he was present at a service — something that would be anathema to SSPX). He should have made this clear — and gotten agreement from SSPX — at the outset. The timing was also quite unfortunate. Anti-Semitic attitudes and expressions around the world today are possibly greater than at any time since the end of WWII, as the virulent anti-Israel propaganda that has been flooding the media from Arab, Iranian and left-wing sources becomes more and more overtly anti-Semitic. Personaly I don’t doubt Pope Benedict’s commitment to the principles of Nostre Aetate, I don’t doubt his understanding of history, and I don’t think he has an antisemitic bone in his body. But I do think that his decision to seek to bring the SSPX back into the fold without first obtaining an unambiguous recantation of their anti-Semitic (and in the case of Williamson, ahistorical) point of view was a serious failure of judgment. Antisemitism has taken many forms throughout its long career. It’s a frustrating rejoinder to those who believe that there is such a thing as social progress analogous to technological development. Many of us think of Christian antisemitism, forged in the struggle of the early Christians with the Roman Empire, as the seminal form from which later Jew-hatreds sprang. There’s some truth to this. In Carroll’s telling, Catholic hostility to Jews goes back at least to the fourth century, when the emperor Constantine conquered Rome, carrying a sword fashioned as a cross. At the time, he says in the film, there were roughly the same number of Jews as Christians in the world. There is no question that it was bad for Jews in the Christian world long after the middle ages. Discrimination, pogroms, even mass expulsions were their lot in Europe for hundreds of years. My own grandparents fled the Pale of Settlement almost exactly 100 years ago to escape violent persecution by the locals, who used Christianity as an excuse for their actions. In one of the most important documents of the modern Church, Nostra Aetate (1965 – read it! ), Pope Paul VI does not dilute what he sees as the fundamental principle of Christianity — that there is only one way to salvation — but calls upon Catholics to understand and appreciate the truths (albeit partial, in his view) found in other religions. Most importantly, he demands that the Church treat adherents of other religions with respect and tolerance, specifically denouncing antisemitism. Unfortunately, at just about the same time that the traditional host of the antisemitism virus began to reject it, a new one appeared. During the 1960’s, the Arab-Israeli conflict had taken the form of a proxy struggle between the US and the Soviet Union, with the Soviets taking the side of the Arabs. This led to such absurdities as fascist Arab regimes like that of Syria declaring themselves to be ‘socialists’, but also to the international Left — which if not pro-Soviet was at least anti-American — taking a strong anti-Israel position as well. Although not all anti-Zionism is antisemitic, there is a natural progression which has been followed here, and today the extreme Left has outstripped the neo-Nazi Right as a reservoir of antisemitic expression. Among the report’s most worrying findings is the growth over the past three decades of uniquely Muslim roots to older European versions of anti-Semitism. Without discounting classical Christian Europe’s canards regarding secret Jewish conspiracies, the ritual slaughter of non-Jewish children and other allegations of Jewish evil, anti-Semitism in the Muslim world increasingly finds its own, Islamic reasons for anti-Jewish hatred through new interpretations of Islamic history and scripture. From the Koranic story of a Jewess who poisoned Muhammad, to the troubled relations between Muhammad and the Jewish tribes of Arabia, radical Islamist groups and thinkers have been using extreme anti-Semitic rhetoric that has grown increasingly popular with the Muslim public, particularly in Iran and the Arab states. Using well-known Koranic texts, these groups have been mapping out the Jews’ “innate negative attributes” and teaching a paradigm of permanent struggle between Muslims and Jews. The report goes on to describe how — instead of European antisemitic literature being imported to the Middle East, it is now exported to Europe, where it influences Muslim segments of the population there. And in the Middle East, antisemitism has government approval in many countries which are allegedly at peace with Israel — like Egypt, where you can buy Arabic translations of The Protocols of the Elders of Zion on many street corners. At the heart of this surge in Muslim anti-Semitism lies Iran, with the regime’s support for Holocaust denial and hosting of anti-Semites from around the world, along with formal calls for Israel’s destruction by many of the country’s leaders. “Iran is the first example of its kind since Nazi Germany in which a state officially adopts an active policy of anti-Semitism as a means to further its national interests,” the report notes. It goes on to say that while Iran does not deny that Jews were massacred during WWII, the current regime seeks to minimize the scale of the Holocaust in order to reduce support for Israel’s very existence in the West, which it believes comes from feelings of guilt over the world’s inaction while Jews were murdered during WWII. So one can understand, in the face of all this, my unconcern about Pope Benedict XVI’s promulgation of a Latin Good Friday prayer that calls for Catholics to pray for the Jews to accept Jesus as savior — something which does not contradict Nostra Aetate, although it is perhaps uncomfortable for some Jews, and although liberal Catholics may wish that the Church had moved further along the road to ecumenicism than it actually did. Nevertheless, it’s unfortunate that other organizations, like the UN, have not followed the lead of the Church in this area. If the world has learned anything from the history of the mid-20th century one would expect firm condemnations — and real sanctions — of governments like those of Egypt and especially Iran, which today exemplify the racist philosophy that should have been buried with Adolf Hitler. The Vatican last month revised the contested Latin prayer used by a traditionalist minority on Good Friday, the day marking Jesus Christ’s crucifixion, removing a reference to Jewish “blindness” over Christ and deleting a phrase asking God to “remove the veil from their hearts”. Jews criticized the new version because it still says they should recognize Jesus Christ as the savior of all men. It asks that “all Israel may be saved” and Jews say it keeps an underlying call to conversion that they had wanted removed. Vatican II changed the ancient Latin version of this prayer, removing the phrase ‘perfidious Jews’. But then it created a new collection of prayers in various local languages — the vernacular liturgy — which was supposed to replace the Latin one. The prayer which appears in the vernacular liturgy does not mention conversion, but the Latin version still did, although ‘perfidious’ was gone. The Latin ritual did not totally disappear, however. Some conservative Catholics continued to use it, but were required to obtain permission from their bishop. The present Pope, as mentioned in the article, is encouraging those Catholics who want to use the Latin ritual to do so, and has removed the requirement for approval. But some Jews and liberal Catholics wish that he had simply translated the vernacular prayer back into Latin. Instead, he chose to create a new prayer that took a middle course — but still mentioned conversion. We can understand the concern, given the long history of Christian antisemitism based to a certain extent on the stiff-necked Jews’ refusal to see the light. And we can also understand the Pope — and many other Christians — for whom a primary part of their belief system is that it is universal. Britain has become the epicenter for anti-Semitic trends in Europe as traditional, age-old anti-Semitism in a country whose literature and cultural tradition were “drenched” in anti-Semitism has developed into a contemporary mix of anti-Semitism and anti-Zionism, an Israeli historian said Monday. Indeed, the desire to see Jews converted to Christianity is dear to Evangelical Protestants here in the US, a group which is generally pro-Zionist and which does not express views common to contemporary antisemites, such as “the Jews are responsible for 9/11 (or the Iraq war, etc. )”, or “the Jewish lobby controls the US government”. Recent violent acts against Jews or Jewish property in the US have mostly been perpetrated by neo-Nazi or racist groups, and radical Muslims. I am personally less bothered by Christian prayers for my conversion than, for example, Hamas’ interpretation of the Quran which calls for Muslims to kill Jews. It should be noted that critics of the Pope are not required to go into hiding because of death threats from Catholic fundamentalists. Possibly those of us who are particularly worried about Christian antisemitism today are like the generals who always prepare to fight the last war instead of the next one?